Instead of ignoring this crazy communication, I decided to share it with our readers, and evidently Ms Howe is not one of them. It sounds to me like she has stumbled across the name 'Slap The Penguin' and without checking her facts, launched a campaign against us, claiming that we are responsible for people assaulting flightless birds. Not only does Ms Howe not check her facts, she also fails to check her spelling, as we have highlighted in the email above. 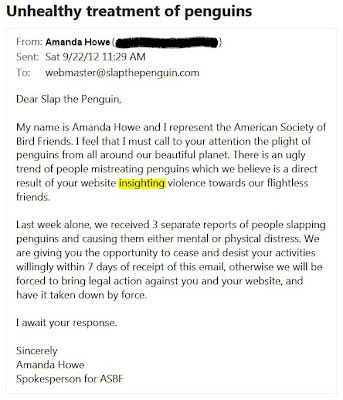 I believe she was trying to say that our website was 'inciting violence'. 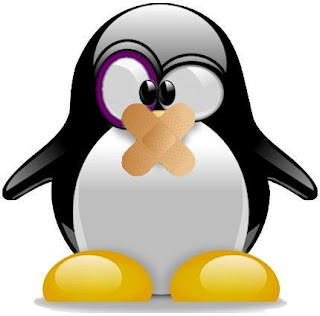 "I slipped on a bar of soap"
Ms Howe also dismally fails to supply any evidence of harm done to penguins either as a result of people reading our pages, or by people who are totally unfamiliar with our satirical news blog. Even trawling the interwebs for instances of people assaulting penguins returned zero results. Stay tuned to see if the ASBF lawyers succeed in taking down this website. 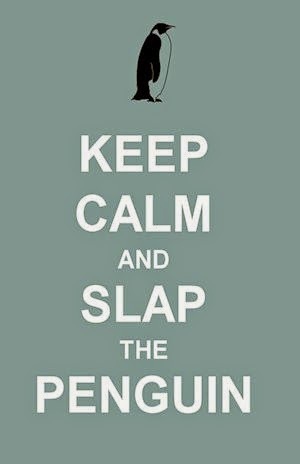 In the meantime if you wish to show your support for Slap the Penguin then leave your comments below. We shall forward them (if suitable) to Ms Howe and her ASBF.